design is a combination of ? nding the is also being made available to other best propeller and nozzle (also called naval architects and engineers as new duct or shroud) while keeping track of hydro-acoustic features are developed their interaction. In other words, you for our tools. 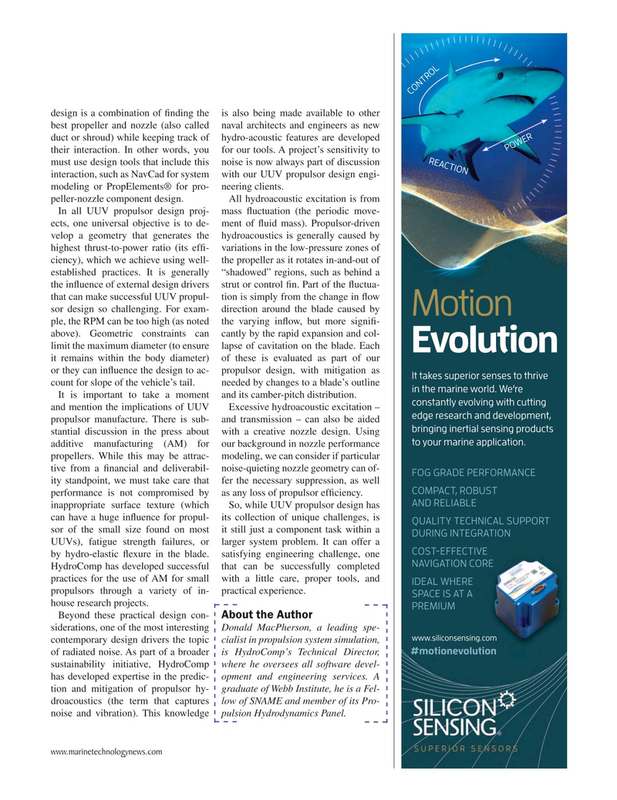 A project’s sensitivity to must use design tools that include this noise is now always part of discussion interaction, such as NavCad for system with our UUV propulsor design engi- modeling or PropElements® for pro- neering clients. It is important to take a moment and its camber-pitch distribution. and mention the implications of UUV Excessive hydroacoustic excitation – propulsor manufacture. There is sub- and transmission – can also be aided stantial discussion in the press about with a creative nozzle design. Using additive manufacturing (AM) for our background in nozzle performance propellers. While this may be attrac- modeling, we can consider if particular tive from a ? nancial and deliverabil- noise-quieting nozzle geometry can of- ity standpoint, we must take care that fer the necessary suppression, as well performance is not compromised by as any loss of propulsor ef? ciency. HydroComp has developed successful that can be successfully completed practices for the use of AM for small with a little care, proper tools, and propulsors through a variety of in- practical experience. Beyond these practical design con- siderations, one of the most interesting Donald MacPherson, a leading spe- contemporary design drivers the topic cialist in propulsion system simulation, of radiated noise. As part of a broader is HydroComp’s Technical Director, sustainability initiative, HydroComp where he oversees all software devel- has developed expertise in the predic- opment and engineering services. A tion and mitigation of propulsor hy- graduate of Webb Institute, he is a Fel- droacoustics (the term that captures low of SNAME and member of its Pro- noise and vibration). This knowledge pulsion Hydrodynamics Panel.